As all Naperville, IL, homeowners know, the climate in the area fluctuates greatly throughout the year and all four seasons. Replacement windows by Infinity from Marvin are designed with all climates in mind. These windows are equipped with features like Low-E coated glass and multiple glass panes to help reduce heat transfer. Additionally, Ultrex® fiberglass frames ensure exceptional strength, and when installed by professionals, these windows can help to reduce drafty air and improve the energy efficiency of homes, no matter the season. As a leader in window replacement, Next Door & Window strives to offer the best windows in the industry, which is why we proudly install Infinity from Marvin fiberglass replacement windows. In order to ensure you receive the perfect windows for your residence, we can paint or stain your windows to match your existing trim. You will receive a window ready to be installed, without the need to hire an outside painting contractor, saving you time and money. For more information, contact Next Door & Window today! Bare Pine or optional Oak head and seat boards allow for stain or paint to match the interior of your home. Infinity casement and awning fiberglass windows incorporate effortless operation and functionality with a multi-point locking system. Awning windows are ideal for areas of your home that require windows high up on the wall like in your basement, to allow access to the outdoors. Casement replacement windows are perfect for any room, including your living room, kitchen, or even bedroom. The simple operation and appeal of these windows make them a popular choice among homeowners. The Easy Wash hinge creates an opening for easy cleaning from the interior of your home. The Clear View hinge option keeps the sash tight to the frame allowing for maximum visibility. The Infinity replacement double hung window is amazingly simple to operate and both lower and upper sash tilt with ease, without removing your screens. The unique tilt release button lets you tilt the lower sash using only one hand, so cleaning is easier than ever. With a matching picture unit available, the Infinity replacement Double Hung provides a high-performance replacement solution for every view in your home. Sashes of different proportions in one unit, commonly called Cottage Style and Oriel Style, are also available, with all the titling and performance features of a regular Infinity replacement Double Hung. The operating sash of glider windows slides effortlessly and can be removed and reinstalled for easy cleaning. These windows are also sometimes referred to as slider windows, and they can be pushed open and closed with just one finger. 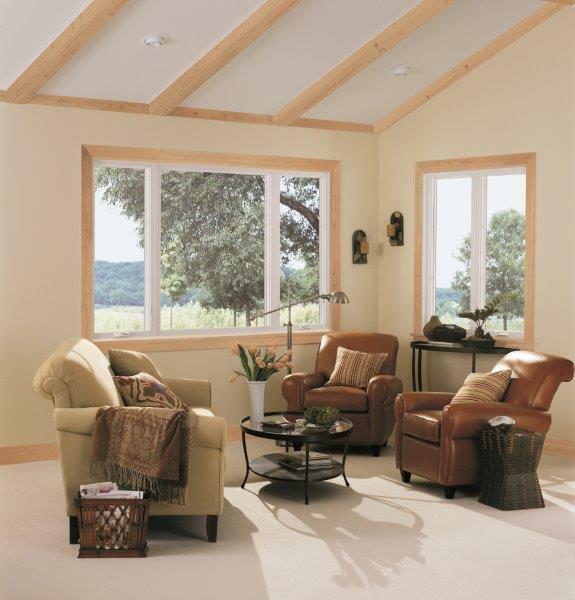 These glider windows operate along a smooth track, allowing for years of flawless and simple operation. With a matching picture unit available, the Infinity replacement Double Hung provides a high performance replacement solution for every view in your home. The operating sash slides effortlessly and can be removed and reinstalled for easy cleaning. Ultrex Fiberglass is 8X stronger than vinyl! Unmatched in fit and finish, Marvin’s Ultimate Swinging French Door offers you a remarkable amount of design flexibility with Marvin’s trusted quality. A concealed multi-point lock with stainless steel head and foot bolts activated from a keyed, lever handle are standard. The screen is a tough extruded aluminum swinging screen that provides solid protection and outstanding performance. Peace of mind. With a view. Take a second look at Infinity’s tough, narrow frame made of Ultrex fiberglass. The Ultrex advantage allows for more glass area than other replacement windows giving you more daylight and better views. Infinity replacement windows are made from Ultrex fiberglass, inside and out. Marvin has nearly two decades of experience creating window and door products made with this strong fiberglass material. The reason we chose it for Infinity replacement windows is simple: fiberglass is superior to other window materials in virtually every category. Over time, vinyl will show its age. Spots, streaks and cracks can appear, and once they do, there isn’t much you can do to help. Ultrex fiberglass stands up to the elements and keeps windows looking great for years. Scorching summer heat or freezing winter temperatures – wherever you live, whatever the climate, Infinity from Marvin replacement windows are outstanding performers. Our replacement window line meets or exceeds industry ratings for air, water and structural performance. Infinity replacement windows are designed to a performance rating of DP30, depending on size, which is a measure of the amount of pressure a window or door is designed to withstand when closed and locked. This means Infinity replacement windows remain strong (standing up to 45 pounds of pressure per square foot, which is equivalent to the pressure created by 132 mph winds) and watertight (withstanding water penetration when exposed to the equivalent of 8” of rain per hour driven by 42 mph winds). Ultrex is an ideal material for windows not only for its amazing strength and ability to repel the elements, but also for its low thermal expansion rate. Cold, heat and time can be tough on some window materials. Vinyl, for instance, can distort in extreme heat due to its high thermal expansion rate (see chart below). Ultrex resists distortion even at temperatures up to 350 degrees F. Rapid temperature change doesn’t faze it either. When the mercury climbed from -30 degrees F to 70 degrees F, a 6’ stile changed less than 1/32” in length! The ENERGY STAR rating from the U.S. Department of Energy and the U.S. Environmental Protection Agency is only granted to products that are designed to reduce energy usage to mandated levels. Infinity from Marvin exceeds the performance requirements and qualifies for the ENERGY STAR rating in all U.S. climate regions. You can paint Infinity products to match exterior colors without affecting the protective performance of Ultrex fiberglass. Introducing EverWood, our revolutionary interior wood grain finish that looks, feels, paints and stains like wood, yet is completely low maintenance for years of lasting beauty. Its natural appearance beautifully complements any interior woodwork in your home. Now you can enjoy all the benefits of wood in a superior, low-maintenance replacement window by Infinity by Marvin. Long-lasting EverWood is made from an inorganic material, and it won’t absorb moisture or decay over time. There’s virtually no warping, discoloration, material degradation, expansion, or contraction, just remarkably reliable performance and lasting beauty year after year. EverWood, the remarkable engineered wood grain finish by Infinity from Marvin, is easy to stain in just a few, simple steps. It takes stain like wood, and thanks to its extreme durability, you’ll enjoy the rich, natural look of wood for years to come. Standard Low E II w/Argon and optional Low E 366 w/Argon glass. They are also available with the optional tempered, obscure and tempered obscure. With just one glance through the Hi Transparency screen, you’ll be amazed at what you see-and what you won’t. You will see a clearer, brighter view without the distortion and haziness that are often experienced with traditional screens. The tighter, finer mesh of the Hi Transparency screen provides a clearer view to the outdoors so you can experience nature the way it was intended-from the bright greens of spring to falls’ most vibrant colors. Infinity replacement windows are available with the grilles between the panes of insulating glass. Choose Simulated-Divided-Lites for an authentic divided glass look. Simulated-Divided-Lite bars are permanently adhered to the outside surfaces of the glass with a spacer bar between the panes of glass.